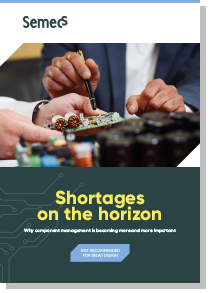 There’s something you need to know about the availability of electronic components. Due to a combination of factors, it can no longer be taken for granted that your electronic components will remain available in the years to come. That means that you as a design owner may be in for some unpleasant surprises. On the one hand, because the production of the electronic components you use could be phased out at any given moment. On the other hand, because supply and demand could have a major impact on the prices of those components. What’s more, we are already being confronted on a daily basis with these shortages and the price rises that they are causing. By ‘we’ in this case, we mean the entire market. That includes both you, our client, and us, the PCB assembly specialist. The good news: there may be a solution that will support your design for better availability. Read all about this in our whitepaper. How is this problem to be solved? By clicking the button below you agree to the storage of your data. We only use your information for providing the requested document, sending other relevant information or contact. You can unsubscribe at any time.